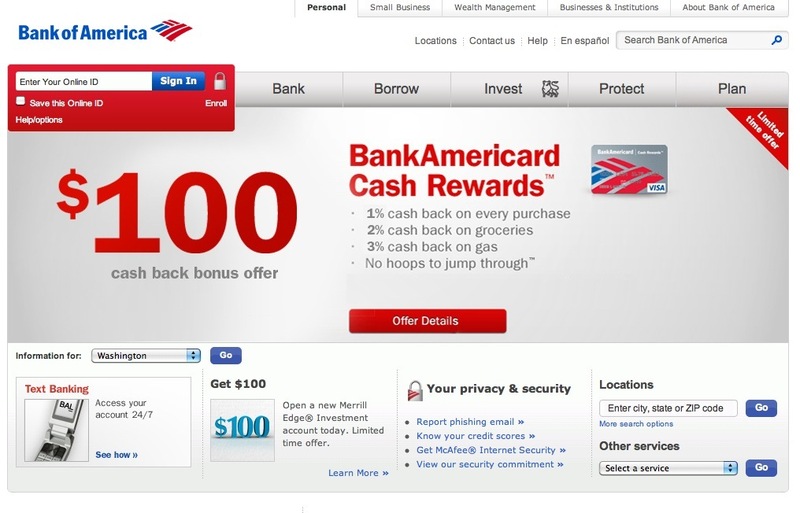 Bankofamerica.com is the online banking platform from Bank of America, which allows customers efficiently manage their accounts, pay their bills, view credit card and operate a series of banking activities by 24-hour self-service. The site is highly clear, organized and professional in design. The blue and red theme color is nicely conformed to the bank’s real life entity. Its task-oriented navigation system provides consistent and efficient operations for customers. To serve banking purposes, the site design is safety guaranteed and presents users a confirmation option before they commit to actions. Plus, search bar and site map are available. The website serves customers of BOA who like self-service and comfortable with online banking experience. The wireless component is aimed to satisfy customer demand for banking services “on one site and anywhere they are”. Wireless is part of the larger Bank of America goal to link all their channels and allow its customers to see the same information wherever they access it. The site does not have much social media integration. But there is BOA app landed on mobile end.